The Greater Bandon Association was recently selected to participate in a National Main Street crowdfunding challenge to develop, build, and install two parklets in Old Town Bandon. A parklet is an extension of the sidewalk into a parking space, which creates a larger area for pedestrians to utilize in a downtown. The parklet movement began in San Francisco, but has made it’s way all over the country in both both big cities and small towns. The program, entitled Cultivating Place Crowdfunding Challenge, is administered through a national, non profit crowdfunding platform called ioby. Ioby’s mission is, “to make meaningful change ‘in our backyards’ – the positive opposite of NIMBY.” Ioby helps fund projects that support organizations working to make neighborhoods, “safer, greener, more livable and more fun.” According to the National Main Street Center, the partnership with ioby is intended to help project leaders learn to raise funds, cultivate a local donor base, find volunteers, and build visibility for their project. Applications were open to Main Street programs in Alabama, Connecticut, Missouri, Montana, and Oregon. Fifteen projects were selected to participate in Cultivating Place Crowdfunding Challenge and will receive $1,500 in 1:1 match to apply toward their ioby crowdfunding campaign, along with one-on-one coaching from one of ioby’s Success Strategists. 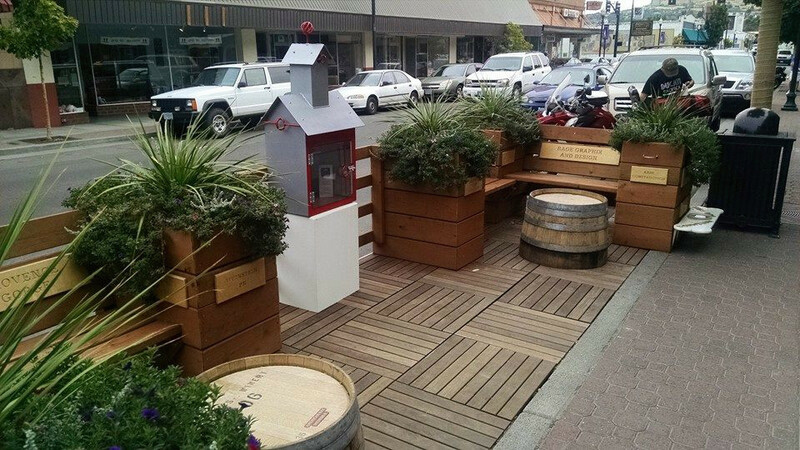 The Bandon Public Parklet Project will begin working with ioby to build a crowdfunding campaign at the beginning of April, and will launch the campaign from April 14th- May 22nd with the intention of raising $1,500 for the project. If successful, the project will receive $1,500 in match from the National Main Street Center. The Greater Bandon Association is working with the City of Bandon to develop a design for the parklet and to determine the exact locations of the two structures within Old Town. The parklets will be temporary structures, likely lasting from June through October, and will have outdoor seating, native landscaping, and local art. For more information about the grant opportunity, parklets, or Old Town placemaking efforts, please contact Dana Nichols at dana@greaterbandon.org.